Mango has a myriad of benefits that are good for the health of our bodies, can treat diseases such as cancer, helps digestion because it is rich in fiber and many more benefits and efficacy that we can get by eating mangoes every day. Mangoes classified as rich fruit beta-carotene and vitamin A. As a provider of vitamin A. Because rich in beta-carotene and vitamin A, eating mangoes can also boost the immune system and can lower the risk of heart disease. Mango also known as Mangifera Indica, this exotic fruit belongs to the family of Anacardiaceae. Though native to Southern and Southeast Asia, the fruit is now also grown in Central and South America, Africa and the Arabian Peninsula also. Today there are over 1,000 different varieties of mangos throughout the world. In a cup of mango slices, contained 105% percent of calories, 76% vitamin C, 25% vitamin A, 11% vitamin B6, 9% prebiotic fiber, 9% copper, 7% potassium, and 4% magnesium. Mangoes can be eaten both raw and ripe. Mangoes are a good source of vitamins and minerals essential for the human body. Always have mangoes in your daily diet to get the health benefit. Mango fruit juice blended with milk as "mango-milk shake." 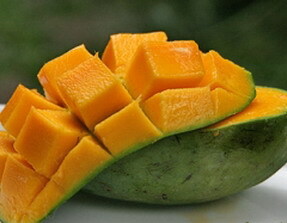 Mango fruit is also used to prepare jam, ice cream and in candy industries.